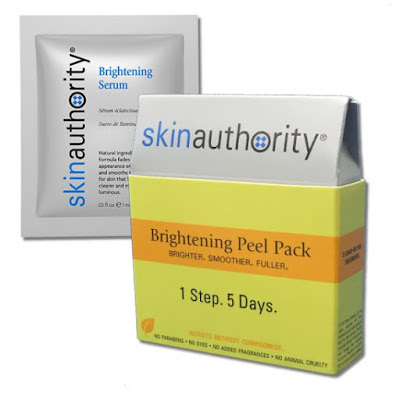 Skin Authority Brightening Peel Pack - 5 treatments - $21 - with a leave-on serum formula of AHA glycolic from sugar cane, natural skin brighteners from the bearberry bush, and complex oligopeptides which work to transform the appearance of fine lines and wrinkles while helping fade spots, freckles, and splotches aggravated by hormones, sun or UV exposure with naturally derived brightening agents as well as hydrates skin. Just use once a day for 5 days and look forward to skin that is bright, radiant, smooth and soft - any skin type can use it, including sensitive and it's even safe to use while pregnant or nursing! Available exclusively at Murale stores across Canada.